Next Saturday, June 16, 2018, I'll be at Croppin' Bug in La Marque, Texas (just south of Houston) teaching a pop-up card class from 9am to noon featuring brand new dies from our Spring collection. Here are the projects and "what to bring" list for students. NOTE: Normally you are instructed to bring your die cutting machine to cut some pieces using the die set included in your kit. However, because of the number of pieces in each card, I have elected to pre-cut all the pieces for the kits to make class go faster. You do not need to bring your die cutting machine to class. You will still receive the Circle Charm Pop-up die set in your kit, but you will not be required to use it during class. We will start with the Circle Charm Pop-up card, featuring the new Sweet Treats Charms and Word Set 6 - Summer. We also make use of the new crosshatch shape dies. Next up, a Tent Pop-up Card. If you need a last-minute Father's Day card this will work wonderfully, but the greeting is generic so you'll be able to use it for any occasion and the colors are gender-neutral. This card also uses the Camping Charms and the nested crosshatch shape dies. Our final card is the Upsy Daisy Pop-up card, assembled in a slide style. There are so many ways to use this die set! Once again it is embellished with the nested crosshatch shape dies. Also used are Word Set 6 and the vine from the Flowers and Bee die set. If you'd like a preview of these die mechanisms and how they work, feel free to watch the assembly videos before class. All your favorite adhesives - tape runner, strong double-sided tape (6mm or 0.25" is the best size), mini glue dots, fine-tip glue pen or bottle. White gel pen - for the lines on the tree stump. Optional - you are always welcome to bring inks for brushing edges. Optional - tweezers for placing small pieces. Optional - Wink of Stella clear glitter pen - for making things sparkly! It's going to be a fun class! Hope you can join us! Happy June, my crafty friends! Today we're celebrating The Great Outdoors with our Designer Challenge and you'll find amazing (AMAZING!) inspiration by the team, especially for using the new Tent Pop-up die set. As the card opens the tent starts to expand. The balloons are suspended on transparency strips. Once open the whole scene is revealed. The Squares - Crosshatch dies were perfect for making the windows, window frames and flower boxes. The flowers came from the Tree Pop-up. These seven Great Outdoors cards are sure to knock your socks off! 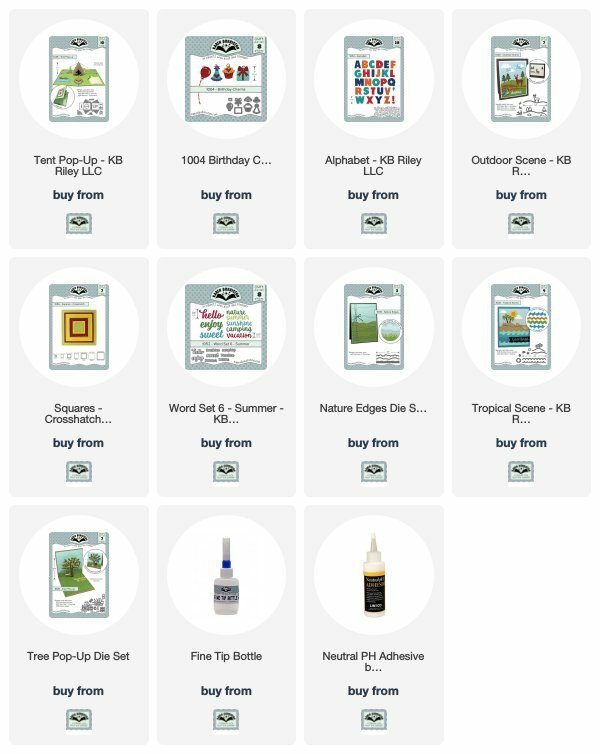 Click on each designer's name to check out their blog post, where you will find more photos, supply lists, tips, etc. Summer Hills-Painter created this wonderful night scene Upsy Daisy pop-up featuring the Tent used flat on the front of the card, plus an amazing glow effect around the Camping Charms lanterns. Karen Aicken has so many tremendous details in this card, which makes use of the floating floor from the House and Fence die set to animate a tent and animals. Amazing! Frances Byrne combined some cute camping-themed stamps to create a wonderful birthday card with the Tent Pop-up and Camping Charms. Adorable! Helen Cryer created this gorgeous feminine Tent Pop-up card featuring a book and beverage mug. I am swooning over this! What a great card for a friend. Helencredible! Kelly Booth has such a way with creating a scene and I love this birthday card featuring the Tent Pop-up. Notice the raccoon (Woodland Animals) sitting on the tree stump and eating a piece of watermelon! Cuuuute! Shelly Hickox made this amazing Father's Day card featuring the Tent Pop-up and a photograph of a relative leaning up next to the tent. How clever! I love her use of plaid and the great textures she created. Shellypiece! Fran Sabad created this showstopper of a beach Tent card that also features the Palm Tree Pop-up behind the tent. Enjoying their own private island are a barrel (or two) of monkeys. Absolutely darling and clever card! Well I hope you feel as inspired as I do after seeing all these magnificent Great Outdoors cards. Join us next month on Wednesday, July 4th (Independence Day!) for our next Designer Challenge with a theme of "Sweet Summer". I'll be at Scrapp'n Savvy this Wednesday teaching a pop-up card class featuring brand new dies from our Spring collection. Here are the projects and "what to bring" list for students. NOTE: Normally you are instructed to bring your die cutting machine to cut some pieces using the Circle Charm Pop-up die set included in your kit. Unfortunately, although the new release dies are en route to our home office in Kansas, they will not arrive by Wednesday. Your class kit dies will be delivered to Scrapp'n Savvy a few days after class. My apologies. Because of this, all pieces have been pre-cut for you and you will not need to bring a die cutting machine to class. On the Tent card, the "Dad" greeting is optional. I will bring the stamp with me to class and students who plan to use the card for Father's Day can stamp their square. All your favorite adhesives - tape runner, double-sided tape, mini glue dots, fine-tip glue pen or bottle. Optional - you are always welcome to bring inks for brushing edges. For example, the edges of the rocks would look great with some dark gray or black ink. Starting today the Design Team is free to share projects made using our Spring 2018 collection. These 12 new dies will start shipping to stores the last week in May with website order being shipped in the orders received starting the first week of June. If you're interested in purchasing any of these dies, please consider giving your local store a chance for your business. The store orders will go out first and you'll save shipping charges by shopping locally. There are three new pop-up dies that offer a little something for everyone. The Circle Charm Pop-up is absolutely generic, plus easy and quick to assemble. The pivoting action of the front circle provides double-duty decoration because it will pivot to the inside as the card is opened. I like to think of the Circle Charm Pop-up die as a hybrid between a Pivot Card and the Charm Accordion. Watch for the assembly video in the coming week to show how it can be changed up and amped up. The set includes 11 individual dies, giving you lots of circle and ring combinations for your pop-up. For this card I easily converted the solid circles to rings and then chained them through the pop-up so that the large lanterns (Camping Charms) all hide behind each other when the card is closed but then reveal as the card opens. The Tent Pop-up is the most specific of the new pop-ups, but is packed with value for creating a complete scene. You get everything - the tent, rivets, extra platform, stump, pop-up fire pit and rocks. Add in the Camping Charms for even more accessories and Word Set 6 for some great greetings. Obviously you can use this tent for camping and outdoor cards, but also think of it more generically. It's a great guy card, for Father's Day or any day. You can make it a beach tent. It works great as a play tent for kid cards and invitations. How about a card for a teacher to say "enjoy summer vacation"? Could it be styled like an A-frame log cabin? A gnome house? This is why I love die cutting - you can so easily change things up! The Upsy Daisy Pop-up is full of possibilities with adaptable platforms that will raise items high in the card and shift them over the outside edges of the card. With the pieces included, you can easily string together three decorative squares and as the card opens, the outer two will lift, separate and pull the middle one up. It's the type of card you'll want to open/close/open/close. When you open the Upsy Daisy all the way until it's almost flat, you'll get the greatest lift and separation on the squares. Take the slack out of your twine, however, and you can stop the card open at 90 degrees (traditional pop-up display) and the squares will sit close together as shown in the card below. Watch for an assembly video later this week to show even more possibilities with the Upsy Daisy. There are two new dies to help you caption your cards perfectly. The Alphabet is uppercase and sized to coordinate perfectly with the previously-released Numbers set. Then we have Word Set 6 - Summer, which can be mixed and matched within the set to make some great combinations, as well as mixed with previous word sets for even more possibilities. Charm dies have become the perfect little accessory dies for our brand. By leaving them as charms, they can be suspended on all the generic pop-ups, including the Charm Accordion to add detail. Our customers report that they love the option to decorate a card using image dies without necessarily always needing to stamp and color images. Obviously the pop-up dies work well to showcase stamped images, too, but it's nice to have the option to decorate with dies. The Camping Charms is the largest of the new sets. We wanted a mix of sizes in this set with some being smaller and sized to match the scale of the Tent Pop-up but then also a couple of larger charms to work well on the fronts of cards and on the other pop-ups. All of these charms work wonderfully with our animal die sets to accessorize. Simply cut off the hang holes and they become props. The Sweet Treats Charms are small, adorable and might make you hungry. Again, they can look so cute being held by the Animal dies, or used on any of the pop-ups for a summery (or should I say "yummery"?) theme. The Beach Charms will coordinate perfectly with the previously-released beach-themed dies, but can also be used independently. I particularly like the idea of using the flamingo with the House and Fence die set to fill the yard! And finally, we have added some much-needed generic nested shape dies to our brand. Each set includes 7 dies, four of which have a fun crosshatch pattern on the edges and three that are solid shapes with a decorative score line for a classy polished look. The largest shapes are sized to fit a standard A2 card leaving a thin border, but they also work well on larger cards. The crosshatch pattern is generic but visually interesting and drawing it brought me right back to my engineering days! Throughout this week you'll see ideas from the Design Team using the new release, as well as the products showing up on the website for pre-order, and videos being uploaded onto the product pages. Also join us on Thursday for a blog hop featuring a mix of Karen Burniston branded dies with Brutus Monroe products. You can hop through our team's blogs to get inspiration for mixing the two lines together and be in on prize opportunities, too. It's a great week for inspiration!